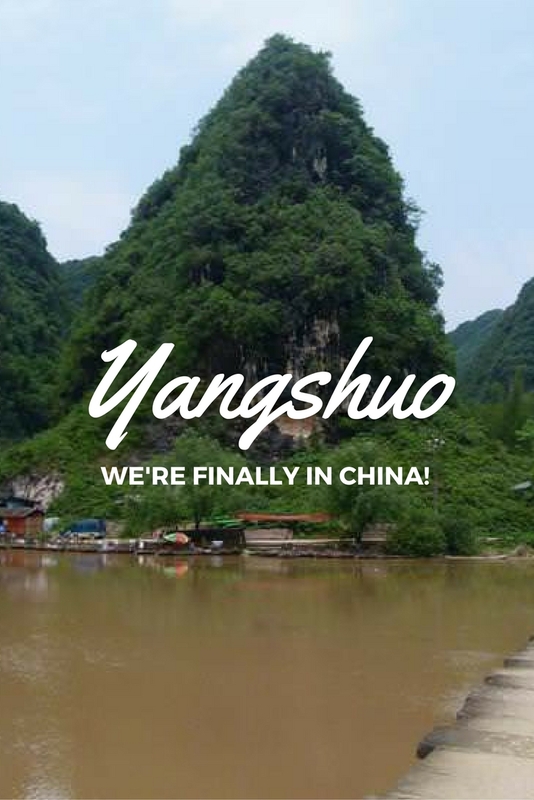 Yangshuo - We're Finally In China! 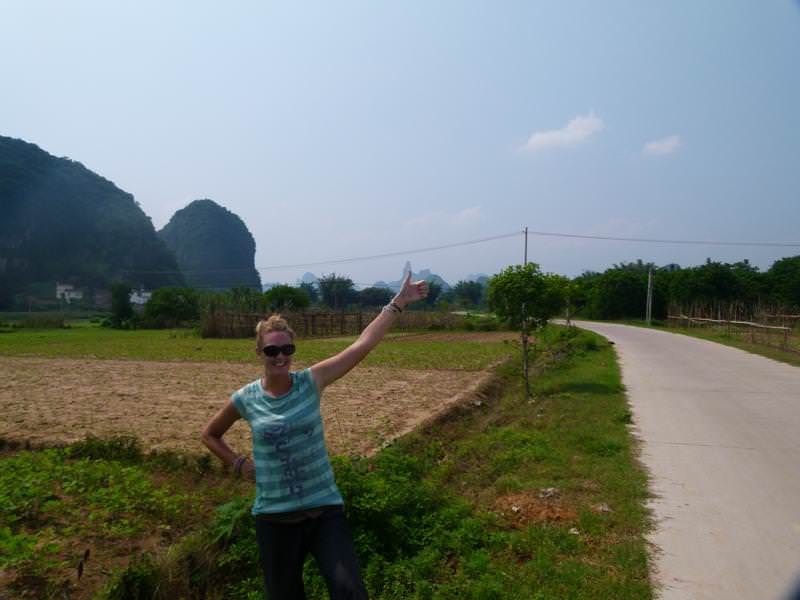 Goats on the Road Posts » Travel Blogs » Asia » Northern Asia » China » Yangshuo – We’re Finally In China! Even though Hong Kong is technically part of China, we still hadn’t felt like we had been to the real China yet and were really looking forward to crossing the border. We were on the super efficient metro line to take us from downtown Hong Kong to the border town of Schenzen. Not a place you really want to spend much time in. It’s a popular place to go for knock-off purses, shoes and clothes. There was some hassle there but it wasn’t too bad. After searching around for somewhere to buy bus tickets, we finally found a security guard who understood our hand gestures and waved at us to follow him. We arrived at the little bus ticket stand and the lady told us the price from Shenzhen to Yangshuo, 320 RMB (about $50). We were shocked at the high price but she said that it’s the May holiday in China and also that the security guard gets a commission for bringing us there! Are you kidding me? We weren’t too impressed about that so we went to the next booth and ended up getting a ticket (without paying commission) for 260 RMB, much better. The overnight bus that pulled up around 7:00pm was remnant of the ones we used to take in Laos and Vietnam, only slightly better. We lucked out and had ground level beds that were just long enough for us to lay down with our legs bent out into the aisle. 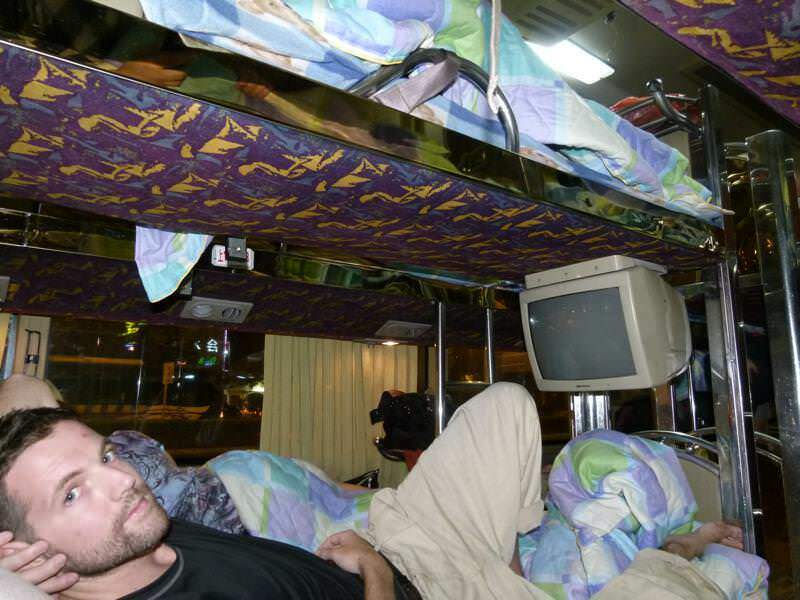 I felt bad for the people who had to sleep on the upper bunk with nothing but a seatbelt to hold them in as we went flying over bumps during the night. 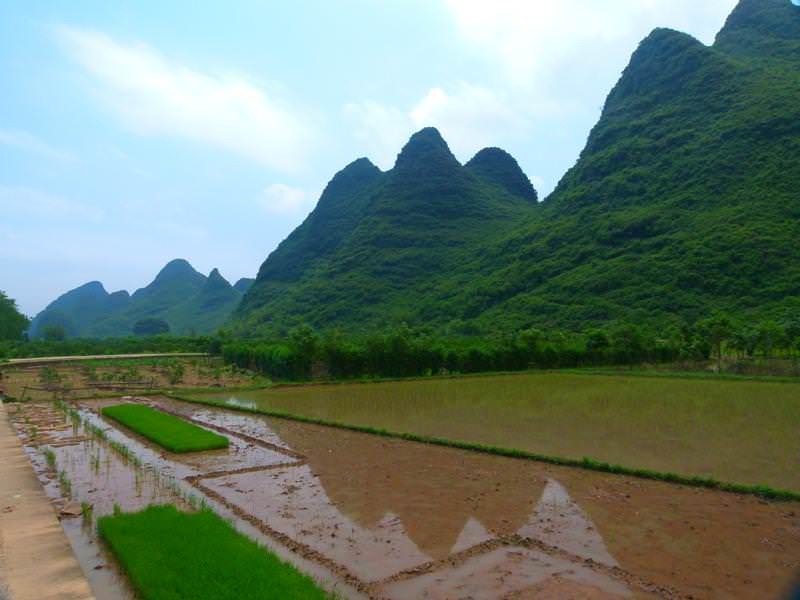 We arrived in Yangshuo at 5:30am during a torrential downpour. All we could think was “great, just like the Philippines”. We checked into our home-stay, Yangshuo Culture House, and went to bed in a really nice room. We awoke 5 hours later to sun beaming in our window, as was the case for the next 3 nights we stayed there! The location of this home-stay is awesome, set just outside of town down a small alleyway where local people sit around playing cards and having tea. Men play the Chinese version of a violin while kids whiz by on bikes, with beautiful red lanterns hanging from the homes above their heads. The owner, Wei, and his family were so friendly and the home-stay was lovely. It included 3 home-cooked meals a day. Breakfast was simple, toast and mango, banana, Chinese apple and oranges. Lunch was fried rice (which we were never around for) and dinner was a massive spread of many different Chinese dishes: sweet and sour chicken, grilled stuffed peppers with pork, sautéed snow peas with garlic and ginger, stir fried beef with peppers and onions, perfectly cooked pumpkin…and the list went on. It was an all you could eat affair and everyone sat around the table gabbing and picking food from the communal dishes with their chopsticks. We definitely looked forward to our dinners each night. 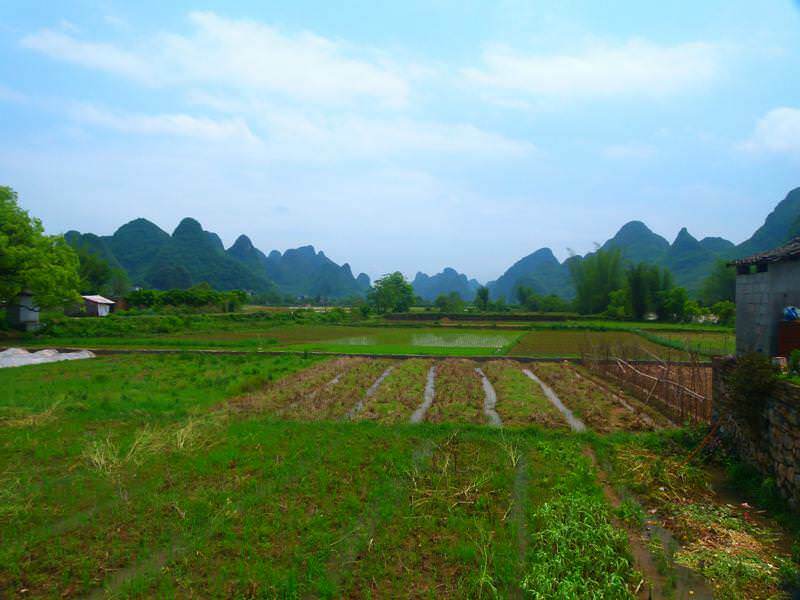 Besides the delicious food, we were in the beautiful area of Yangshuo to see the countryside. 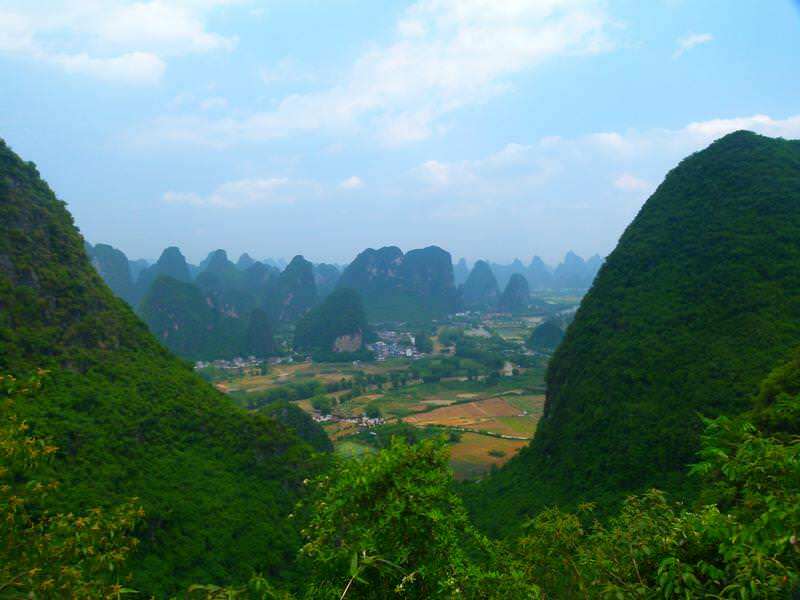 This part of Guangxi province is known for its stunning landscapes dotted with limestone karsts rising from the earth. 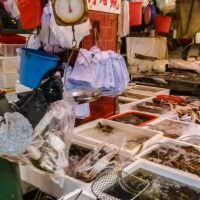 Similar to those found in Thailand, Vietnam, Laos & the Philippines; however, we have never seen so many in one place. The karsts stretch for as far as the eye can see in all directions. We decided that the best way to see the countryside and the karsts up close would be to rent bicycles and head off. We got ourselves a very basic map and made our way towards the countryside. 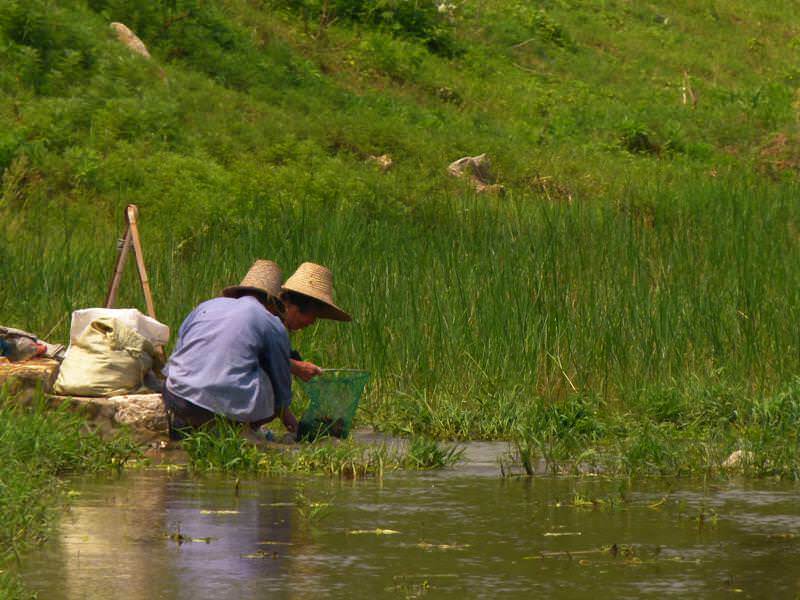 We rode along the Yulong River, through farmland, into small villages, past men fishing along the banks of the river and along silent back roads. We rode for about 3.5 hours before calling it a day. It was about 30 degrees and we were so incredibly hot that we came back to town, inhaled a couple of Gatorades and went for an afternoon nap. 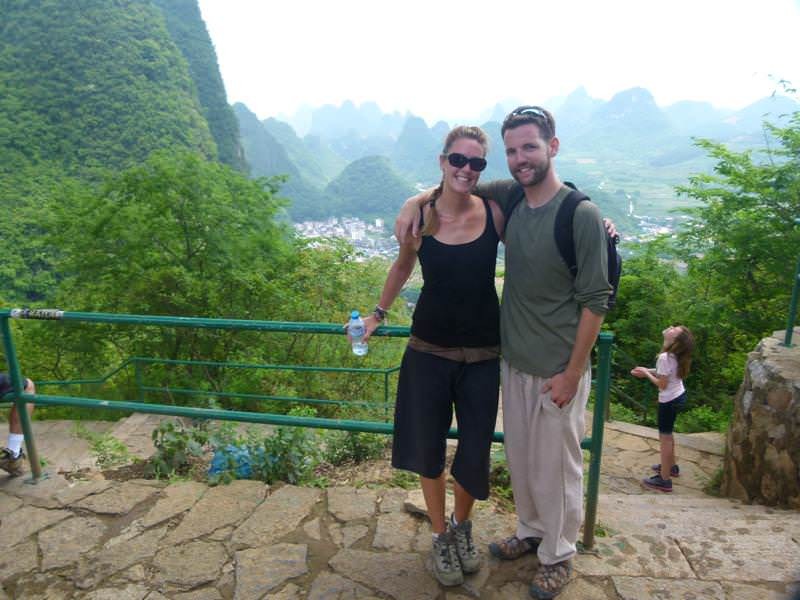 A great first day in Yangshuo. 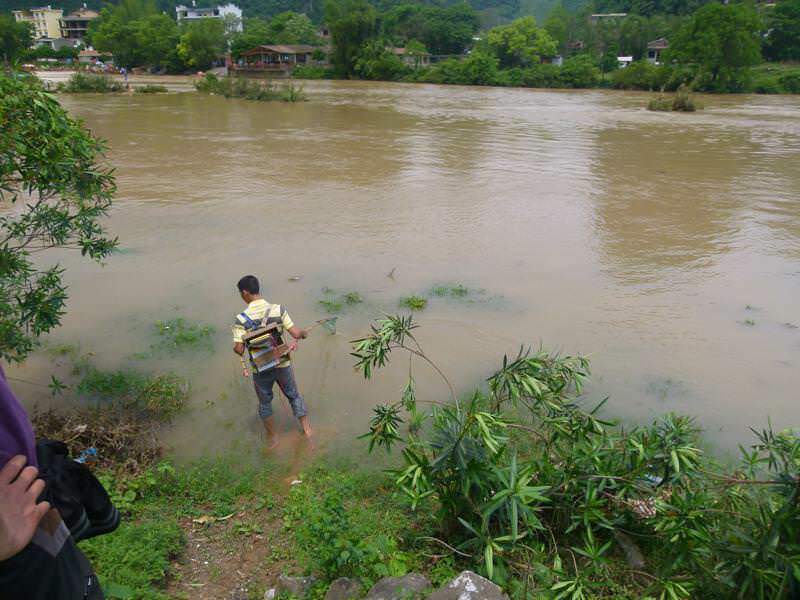 a man “fishing” in the river – using a car battery to fry the fish! The second day was spent the same way, but this time we wanted to see some of the typical touristy things in the area. 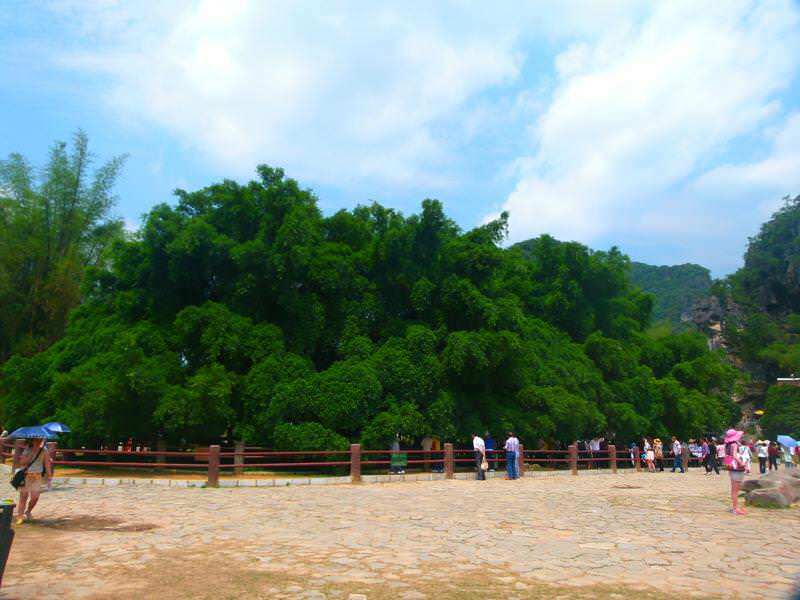 We went to see Moon Hill and the Banyon Tree. This day was the actual holiday day and the main roads were packed with local tourist buses, minibuses, cars, motorbikes and bicycles. We were brave and weaved our way in and out of the traffic, ringing our little handlebar bell constantly! We ended up at the Banyon tree, a 17 meter high tree with a trunk measuring 7 meters around! 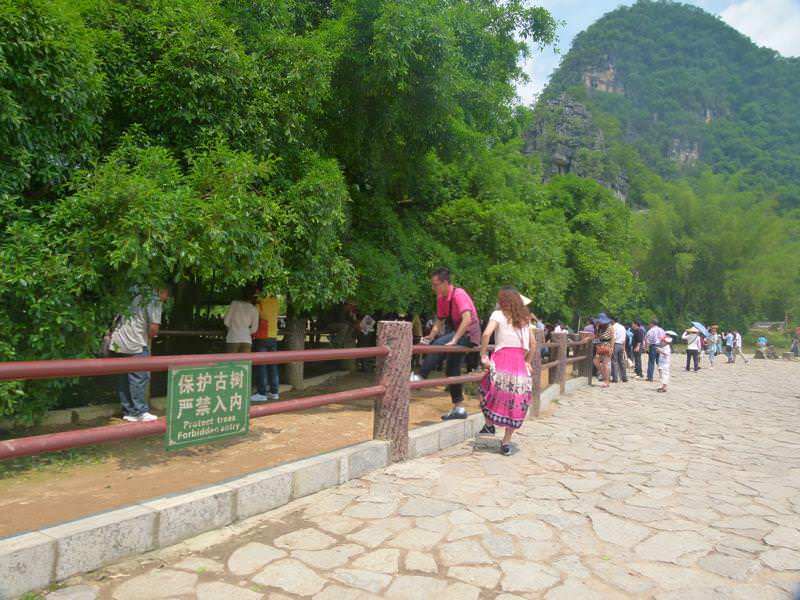 It was planted over 1400 years ago and is set in the middle of a park with the Jinbao River on one side. they never listen to the signs!! We walked through the river to cool off and had our photo taken by some curious local people. 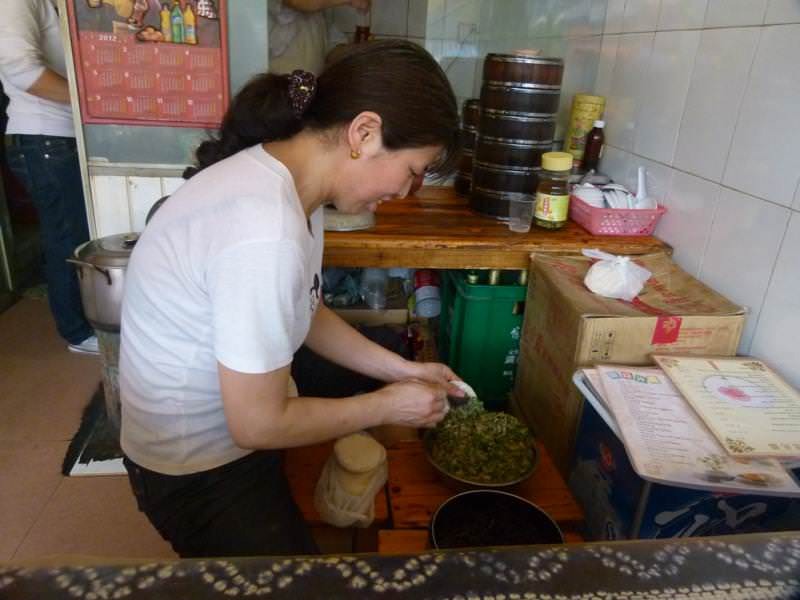 We found the people in Yangshuo to be so friendly. Everyone says hello as they walk past and even though they don’t speak English, they will try their hardest to help and answer questions if needed. 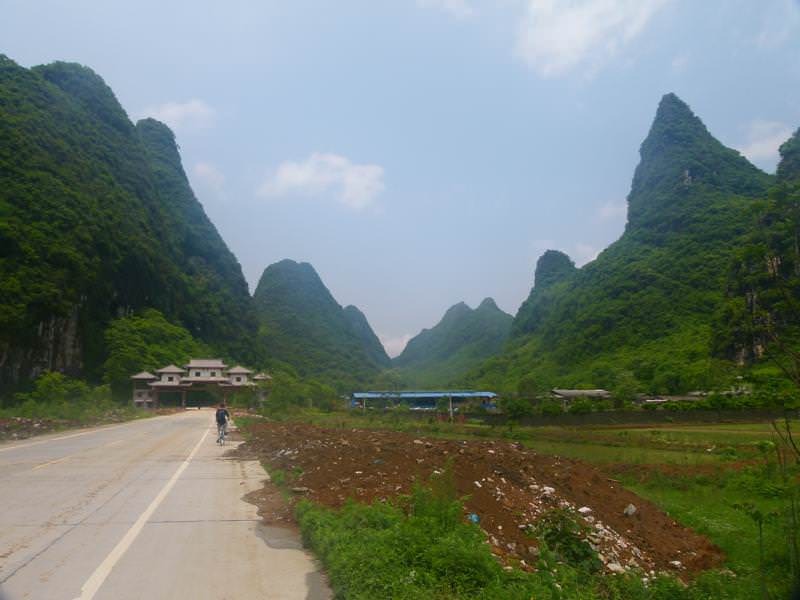 After our quick Banyon break, we were back on our 10 speed bikes, dodging fumes and other vehicles as we made our way to Moon Hill. 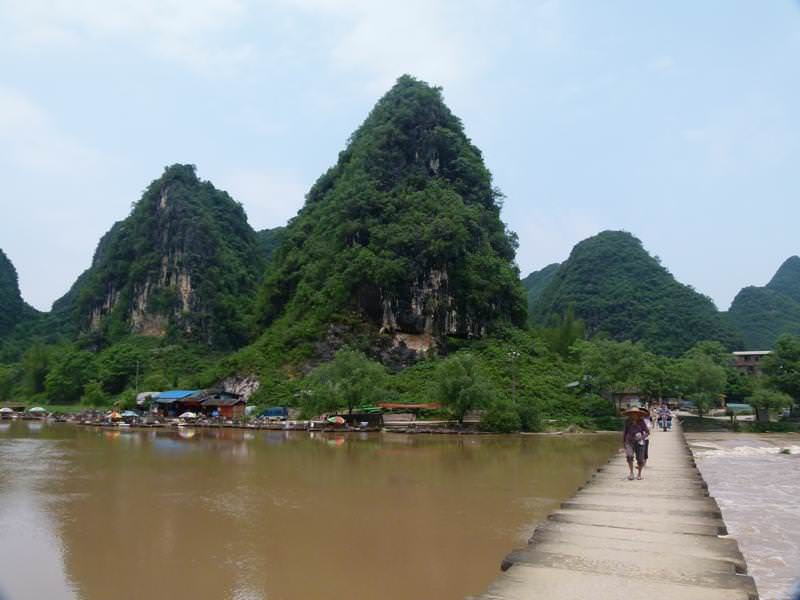 We parked our bikes, bought a couple of waters and headed in to see the limestone cliff with a natural moon shape carved out of it. Pretty cool. We thought we were just there to look at it from a distance but we soon realized we were actually meant to climb to the top of the cliff to get a first hand view. So, up 800 rock-cut stairs we went. We were dripping, and I mean dripping, sweat. It was beyond humid and it was 33+ degrees that day. The hike to the top was totally worth it though, the views were fantastic. 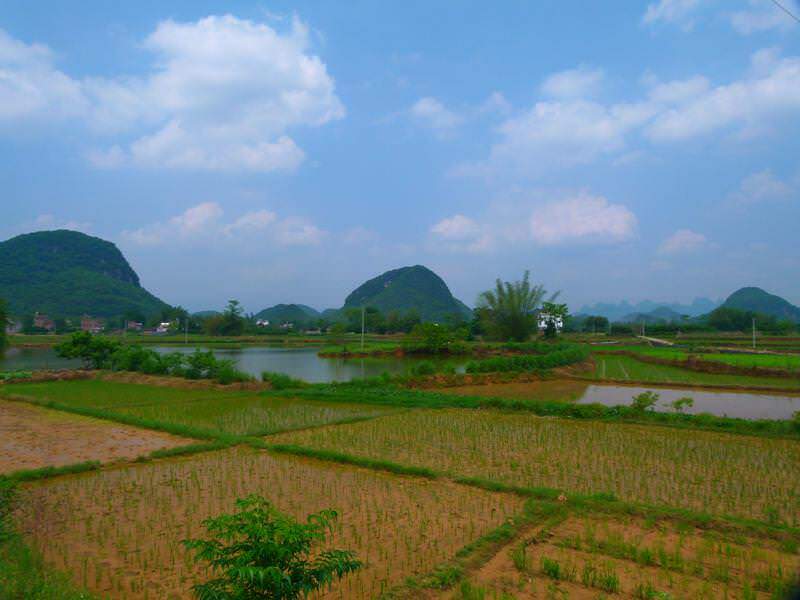 We could look out all around us and see mounds of karsts jutting out of the ground, and in between them were small villages, it was great. Needless to say, the descent was much easier. 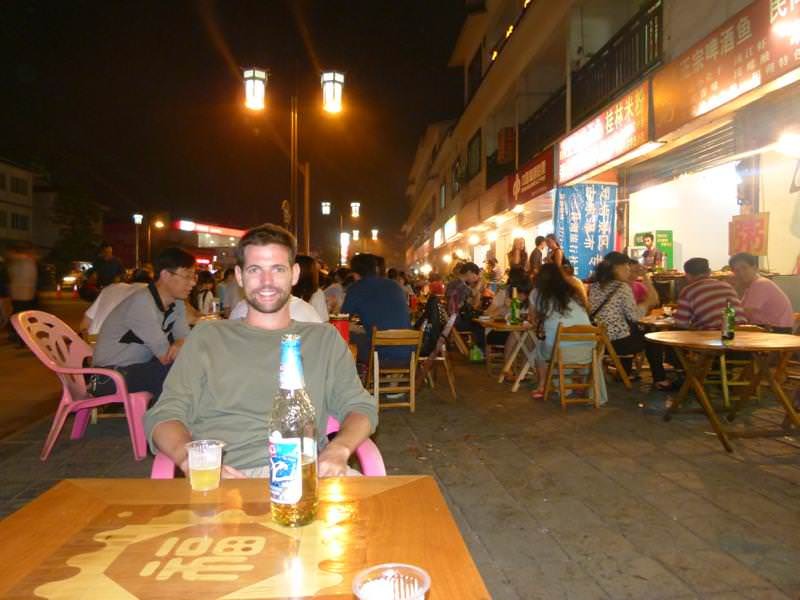 We hoisted our tired legs back on our bike and set back to Yangshuo. 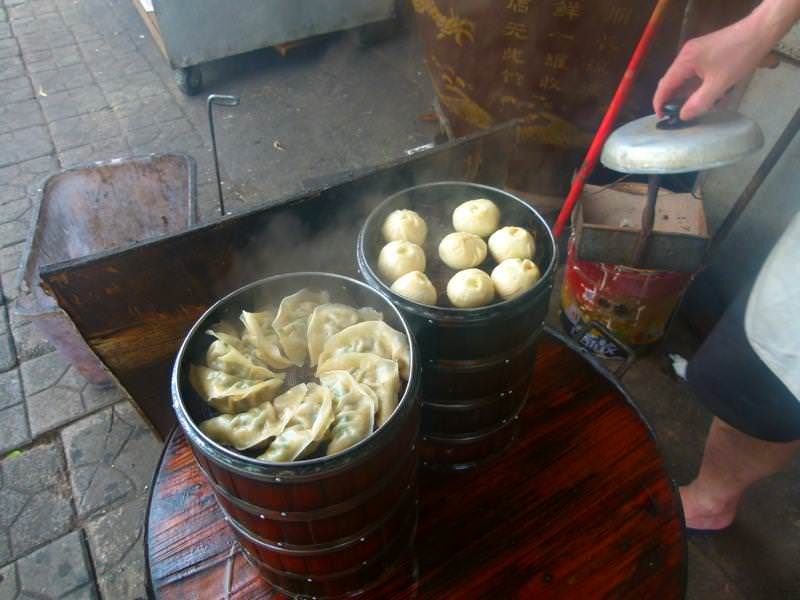 We found a fabulous little place to have lunch; steamed and fried pork dumplings dipped in a soy and chilli sauce, perfect lunch spot! It was so good that we ended up eating there a couple of times. 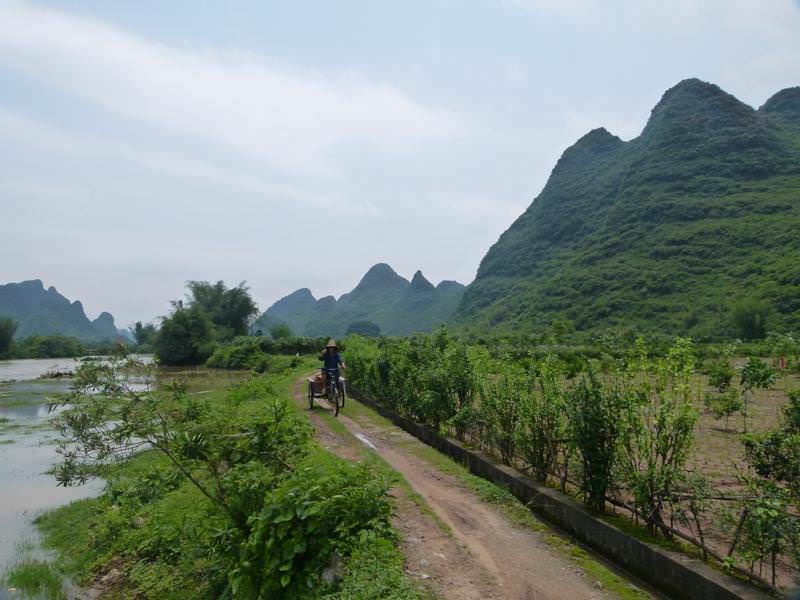 Our third, and final, day in Yangshuo was much like the ones before: wake up to a delicious fresh breakfast, rent a bike and head off! 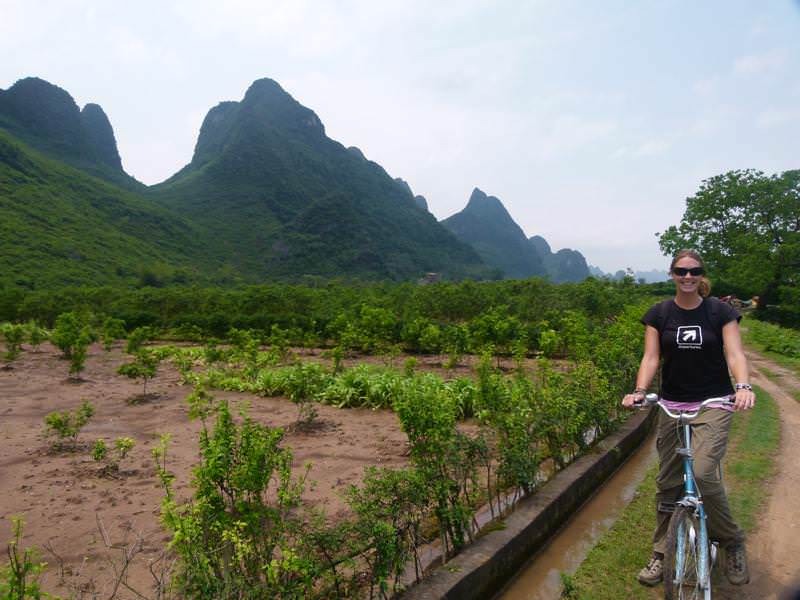 This time we were going in a different direction, over to the Li River and across to the village of Fuli. This was by far the best ride yet. 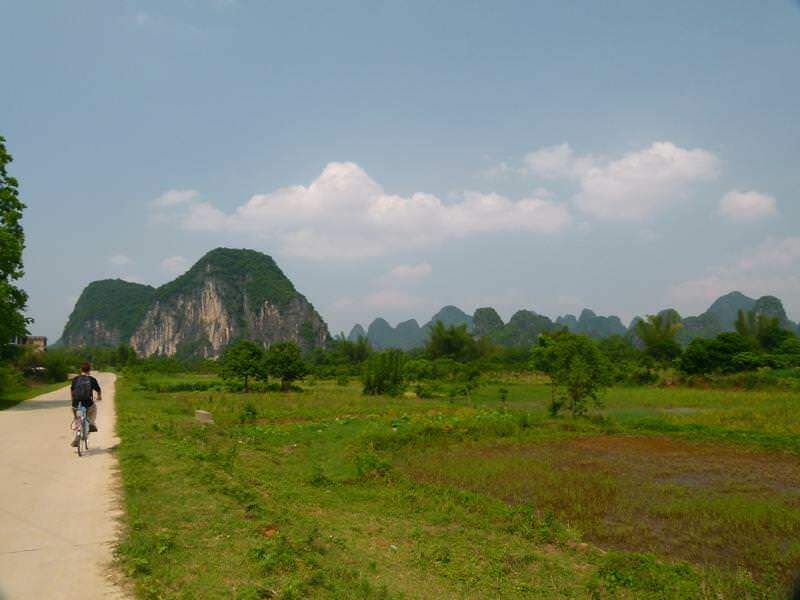 There was hardly a car on the road, it was silent, the scenery spectacular, the villagers along the way were so kind. It as a very peaceful day. We stopped along the river at a little cafe for a drink and to cool down before making our way further along. We actually ended up missing the turn off for Fuli (which isn’t surprising as nothing is written in English) and therefore ended up in some very rural villages, with some great sights. Women were panning for snails in the river, water buffalos were cooling off in the muddy water and farmers were walking their buffalo down the streets. Yep, we certainly didn’t mind that we had to backtrack to Fuli. 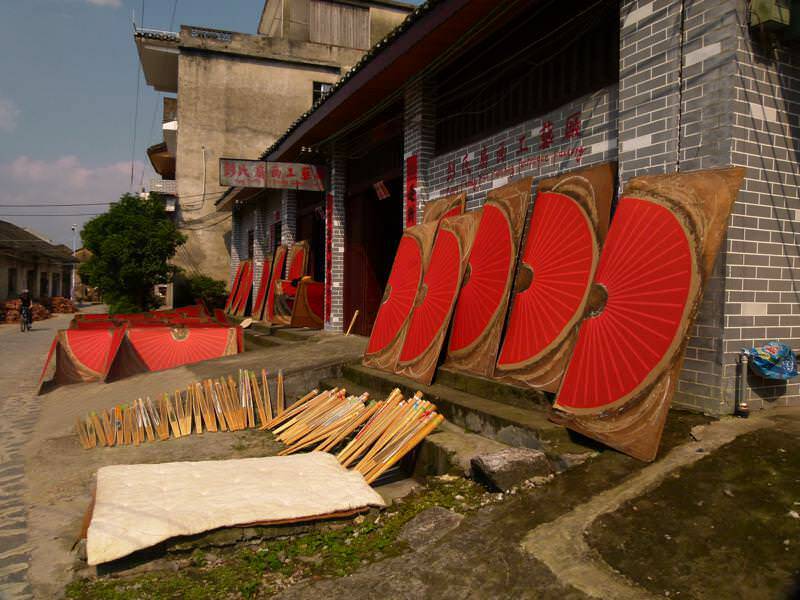 We took a little ferry across the Li River to the town of Fuli, known for its handmade fans. The little lanes were filled with shops with men and women applying their painting skills to handmade silk fans, skills that have been passed down from generation to generation. 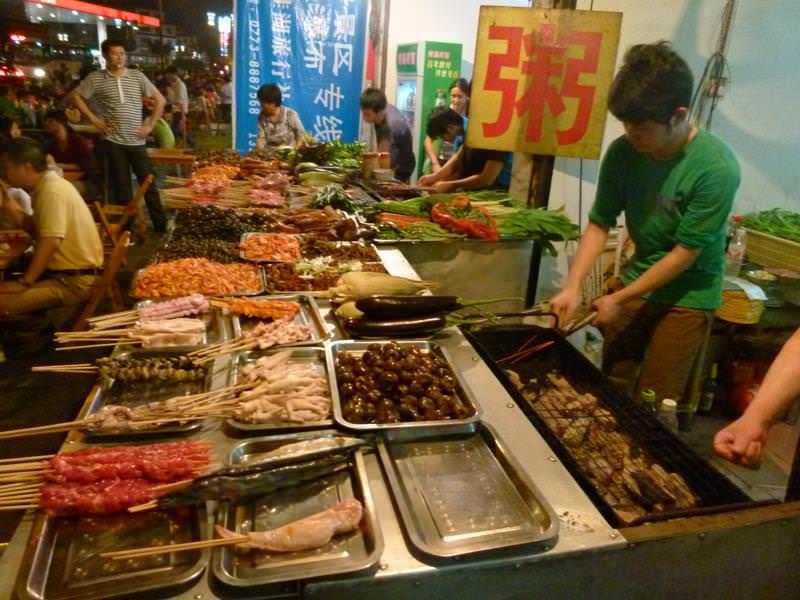 We browsed around before heading back to Yangshuo in time for our homemade dinner to be served! That night we met some great people, Jeanette & Nic, a couple from England who have been travelling for 3 years, half of which was spent cycling across countries! They were so upbeat, positive and easy-going and it was a pleasure to chat with them. They have no plans as of yet and are still enjoying being on the road. They were a true inspiration. 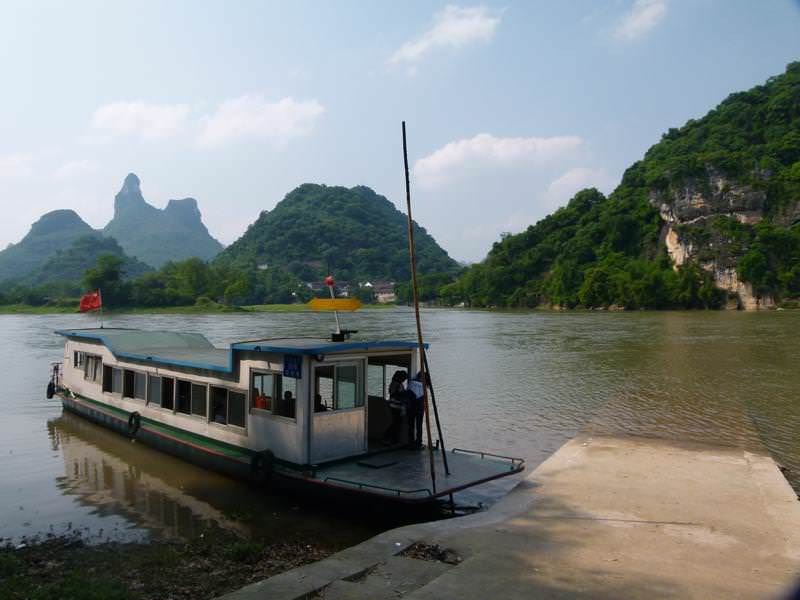 The next morning we dragged our aching bodies out of our warm bed and hopped on a local bus to take us on the one hour journey to the City of Guilin. Look’n good as always. Love the scenic photos! Really love the one of you both after your 800 step sweaty hike up to the top…nice job! So glad we aren’t the only ones sweating like crazy! Thanks for the comment Tess! 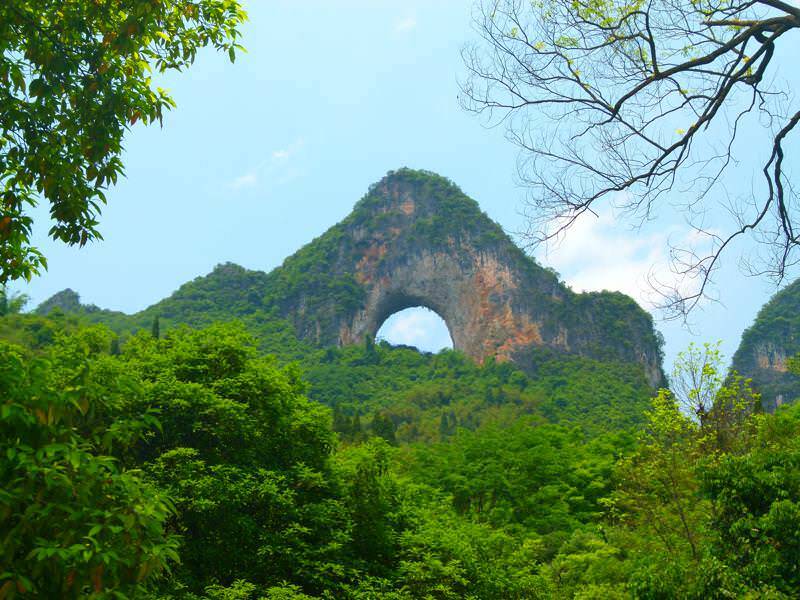 Yangshuo is an amazing place. The hike up to Moon hill was tough, but worth it. 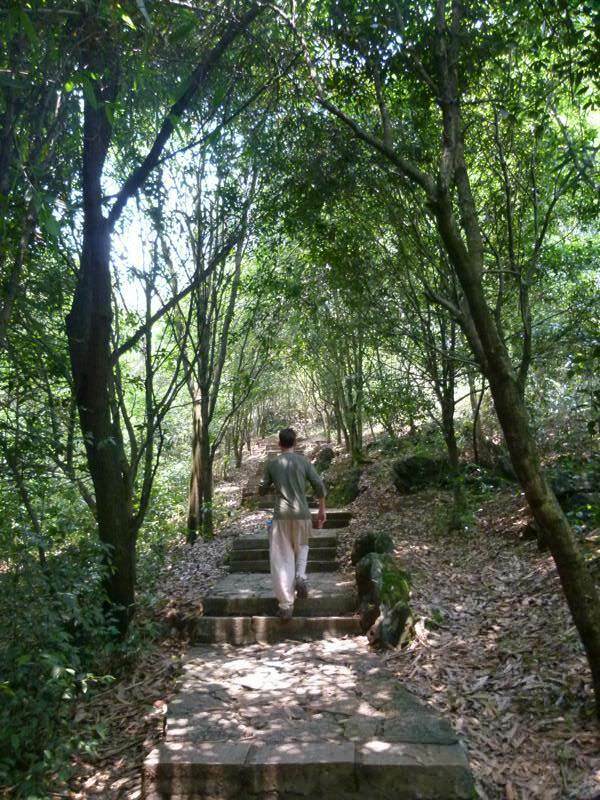 We’re now living in Yangzhou, but would love to return south one day and see more of it! 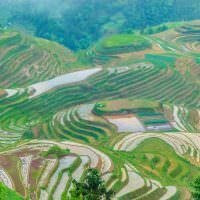 Yunnan is supposed to be amazing.